Located about 25 miles east of Pittsburg, PA, the Battle of Bushy Run Reenactment is usually held on the first weekend of August at the Bushy Run Battlefield in Jeannette, Pennsylvania. It commemorates a battle during the French and Indian war more than 250 years ago. The French and Indian War was a seven-year war in North America between England, their American colonies, and their Native American allies against the French and their Native American allies. This war had become a world war. When the war ended, France was no longer in control of Canada and the Indians who had been threatening the American colonists were defeated. Great Britain spent a great deal of money in the conflict and colonists fully participated in this war. Both these facts were to have a profound effect on the future of the colonies. The British victory at Bushy Run was the critical turning point in Pontiac’s War. It also prevented the capture of Fort Pitt (Pittsburgh) and restored lines of communication between the frontier and eastern settlements. The British victory helped to keep the “gateway to western expansion” open. Pontiac, an Ottawa chief in the Detroit areas, retaliated against British policies and control following the collapse of New France at the close of the French and Indian War. Because of Pontiac’s successful advances against the British, Indian revolts quickly spread eastward. His plans were covert until 1763 when attacks on British outposts began. By the end of July, nine British forts were captured, a tenth fort abandoned, and the great strongholds of Pitt and Detroit under seige. The geographic area affected included the present states of Pennsylvania, New York, Ohio, Indiana, Michigan, Wisconsin and parts of Maryland and West Virginia. Truly this was the greatest Indian threat to the British colonies during the 18th century. Because the Indians so throroughly controlled the frontier, information about the war filtered slowly east to the British high command. Once the scope of the situation was realized in late June, an expedition was organized to march west to Fort Pitt and then to proceed north and west to re-estabish fallen forts. Colonel Henry Bouquet, a Swiss born professional soldier, commanded the expedition of about 400 British soldiers as it left Carlisle, Pennsylvania on July 18th to relieve the besieged Fort Pitt and end a series of unchecked attacks against frontier outposts. Indian scouts observed Bouquet’s army marching west along Forbes Road and reported this to the large force of Indians surrounding Fort Pitt. The Indians decided to temporarily end their siege and attack the British expedition in the open. The attack took place one mile east of Bushy Run Station on August 5th and 6th, 1763. The engagement resulted in a victory for the British. The opening of western Pennsylvania to settlement was the result of a decisive victory over the Native Americans at the Battle of Bushy Run, August 5th and 6th, 1763. Bushy Run Battlefield is the only historic site or museum that deals exclusively with Pontiac’s War, one of the most significant Native American conflicts in American History. The battlefield today is topographically intact. Combatants’ positions and maneuvers can be “seen” and understood and the wooded acres (90 acres) give a sense of the original environment at the time of the battle. Self-guiding trails, guided tours and interpretive programs return visitors to the days of the battle. Interpretive exhibits located in a modern Visitor’s Center aid the visitor in understanding the significance of the events that occurred at Bushy Run. July 29 – A French expedition led by Pierre-Joseph Céleron de Blainville claims the Ohio Country in the name of Louis XV of France (Warren, PA). May 3 – French troops land at the site of present-day Erie, PA, and begin construction of Fort Presqu’ Isle. July 11 – The French begin construction of Fort LeBoeuf (Waterford, PA). August 28 – French soldiers occupy John Fraser’s trading post at the Indian village of Venango (Franklin, PA). December 11 – Twenty-one-year-old Major George Washington reaches Fort LeBoeuf with a letter from Robert Dinwiddie, Governor of Virginia, claiming that the French are trespassing on British territory. February 17 – Forty Virginia militiamen under Captain William Trent begin constructing Fort Prince George at the forks of the Ohio (Pittsburgh). April 17 – Fort Prince George’s garrison surrenders without a fight to a French force of 500 men. The French begin constructing Fort Duquesne shortly thereafter. May 28 – A Virginia militia detachment under George Washington attack a small French force east of present-day Uniontown, PA. Eleven French soldiers, including their commander Ensign Villiers de Jumonville, are killed; 21 are captured, and only one French soldier escapes. Washington loses are one man killed and a few wounded out of 40 under his command. This brief encounter is considered to be the beginning of the French and Indian War. 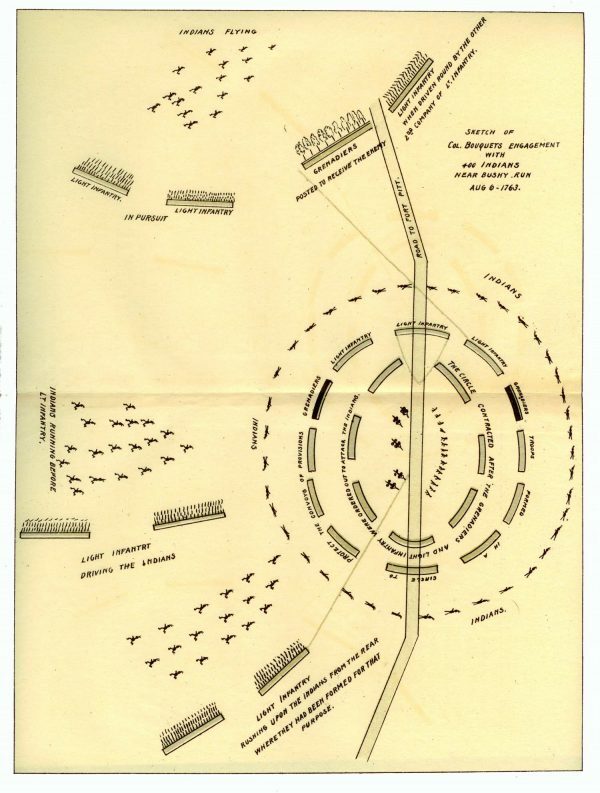 July 3 – Approximately 600 French troops and 100 Native Americans attack 300 colonial and British soldiers at the hastily built Fort Necessity. July 4 – Washington surrenders the fort and retreats to Virginia. March 15 – Major-General Edward Braddock’s British army of about 1,350 British regulars and 500 colonial troops leave Alexandria, VA, intending to capture Fort Duquesne. July 9 – Braddock’s campaign ends in disaster at the Battle of Monongahela, eight miles east of Fort Duquesne. Nearly two-thirds of the 1,500 British troops engaged are killed or wounded, including Braddock himself, who dies during the retreat. The French and Indian force of nearly 900 suffers less than 50 casualties. October 16 – Following Braddock’s defeat, natives begin a reign of terror on the frontier with an attack on the Penn’s Creek settlement on the Susquehanna River. July 30 – A French and Indian force captures and burns Fort Granville (near Lewiston, PA). August 17 – Lieutenant Colonel Henry Bouquet arrives in New York to begin recruiting soldiers for the new 60th (Royal American) Regiment of Foot. September 8 – Colonel John Armstrong leads a force of 300 Pennsylvanians on a successful raid of the Delaware village of Kittanning. April 18 – Brigadier General John Forbes arrives in Philadelphia to organize an expedition against Fort Duquesne. June 2 – British forces begin building Forbes Road. June 24 – Construction of a fort and storehouses at Raystown (Bedford) begins. Sept ember 3– Colonel James Burd arrives at Loyalhanna with 2,500 men to begin constructing Fort Ligonier. September 14 – With Bouquet’s permission, Major James Grant launches an unsuccessful attack on Fort Duquesne, losing nearly 300 troops out of 850 engaged. The French and Native Americans lose 16 out of 800. October 12 – Fort Ligonier repulses a French attack. October 26 – Lenape and Iroquois sign the Treaty of Easton with the British at Easton, PA. In the treaty, colonials recognize Native American rights to lands west of the Allegheny Mountains. Native Americans in turn promise to remain neutral in the conflict between France and England, and detach themselves from their French alliances. November 2 – General Forbes and his entourage reach Loyalhanna. November 24 – The French abandon and destroy Fort Duquesne. General Forbes and his army take formal possession of the fort the following day. November 26 – Forbes renames Fort Duquesne Pittsburgh, in honor of Prime Minister William Pitt. March 11 – General Forbes dies in Philadelphia. July – A large French force at Venango prepares to attack Pittsburgh when it is ordered to march to the assistance of Fort Niagara instead. July 25 – Fort Niagara surrenders to the British. August – The French destroy their remaining forts—Machault, LeBoeuf, and Presqu’ Isle—and abandon western Pennsylvania. August 1 – Construction begins on Fort Pitt. September 3 – British begin building Fort Pitt, the South Fork of Forbes Road (Bouquet’s Road), and the post at Bushy Run (Wetterholt’s). September 13 – British General Wolfe defeats French General Montcalm on the Plains of Abraham, outside Quebec. September 18 – Quebec surrenders to the British. July 7 – Colonel Bouquet leads an expedition from Fort Pitt to Presqu’ Isle to construct a fort there. The British also build forts at Venango and LeBoeuf. September 8 – French Canada surrenders to the British Army, ending most of the fighting between the French and the British in North America. February 22 – Amherst orders a reduction in presents to Native American leaders. April 22 – Despite previous promises at Easton to the Natives that there would be no permanent settlements west of the Allegheny Mts., Bouquet asks General Jeffrey Amherst to authorize the building of taverns between Bedford and Pittsburgh. July 4 – At a conference near Detroit, the Seneca seek Shawnee and western tribe support (Wyandot, Chippewa, Potawatomi and Ottawa) for attacks on Forts Detroit, Sandusky, LeBoeuf, Venango and Pitt. The Wyandot persuade the other tribes not to join the plot. October 30 – Bouquet issues a proclamation forbidding hunting and settling west of the Alleghenies. The law proves to be unenforceable. February 10 – British and French sign The Treaty of Paris, officially ending the French and Indian War. April 27 – Pontiac, an Ottawa leader, reportedly addresses a council of Native Americans near Detroit, convincing them that a war with the British is necessary to protect their way of life. May 9 – Pontiac’s War begins. Native Americans under Pontiac attack Fort Detroit and besiege it under October 30th. May 16-27 – Native Americans capture the western forts of Sandusky, St. Joseph and Miami. May 29 – Native Americans begin harassing Fort Pitt. June 1 – Fort Ouiatenon falls to the natives. June 2 – Fort Michilimackinac is the last western outpost to fall. Native Americans fire on Fort Ligonier. June 6 – Upon receiving reports from Captain Ecuyer, commander of Fort Pitt, of the disasters on the frontier, General Amherst assembles his last reserves—the 42nd and 77th Highland regiments—on Staten Island. June 12 – Amherst sends two light infantry companies to Bouquet in Carlisle. June 16 – Native Americans capture Fort Venango and massacre its small garrison. June 18 – Native Americans capture Fort LeBoeuf. Most of the garrison escapes to Fort Pitt. June 21 – Native Americans ambush a fifteen-man foray party just outside Fort Ligonier. June 22 – After a two-day fight, Fort Presqu’ Isle surrenders and Native Americans take its garrison captive. By the end of the month, Indians sever Fort Pitt’s communications. June 23 – Amherst sends 360 Highlanders from New York to join Bouquet’s troops in Carlisle. June 28 – The first two companies of Highlanders arrive in Carlisle. July 8 – Pennsylvania’s Provincial Assembly authorizes the recruiting of 700 men to guard the territory east of the Allegheny Mountains. July 10 – The final group of Highlanders from New York reaches Carlisle. July 15 – Bouquet’s expedition to relieve Fort Pitt leaves Carlisle. July 25 – Bouquet’s army reaches Fort Bedford and recruits scouts/woodsmen. July 26 – Delaware and Shawnee chiefs urge Captain Ecuyer to withdraw his garrison from Fort Pitt; Ecuyer declines. July 28 – The natives begin the attack and siege of Fort Pitt, which lasts until August 1st. August 2 – Bouquet’s troops reach Fort Ligonier; they rest for two days, and transfer the flour provisions for Fort Pitt from the wagon barrels they had been using to 340 packhorses. August 10 – Bouquet and his army reach Fort Pitt. October 7 – King George III signs the Proclamation of 1763, reserving land west of the Allegheny Mountains for the Native Americans. August 12 – A preliminary treaty is made with the Delaware and Shawnee by Colonel Bradstreet at Presqu’ Isle. October 3 – An army of 1,500 men, commanded by Colonel Bouquet, leaves Fort Pitt on an expedition into the Ohio Country. October 17 – Bouquet begins several days of conferences with the Native Americans at the forks of the Muskingum River in the Ohio Country. Over 200 prisoners are turned over to him, and the natives agree to send representatives to New York to make a formal treaty. December 5 – John Penn, Governor of Pennsylvania, proclaims the end of Pontiac’s War. The site of the 1763 battle between the British Army and Chief Pontiac’s Native American Confederation is a must see attraction. Visitors will first start at the visitor center, which includes a small museum that details the events leading up to Pontiac’s Rebellion with the highlight of the museum being the 13 minute long documentary Road To Bushy Run. Afterwards, you can either take a golf cart tour that loops around the battlefield or take your own self guided tour and walk in the footsteps the men who fought 250 years ago did. Sadly, the first day’s battleground has become barren due to a farm being located on the site at one point. Edge Hill, where the second day’s fighting occured is still preserved in the state it was during the battle. There are numerous hiking trails that weave through the woods around Edge Hill (which provide an idea of what the 1st day’s battle ground was like). 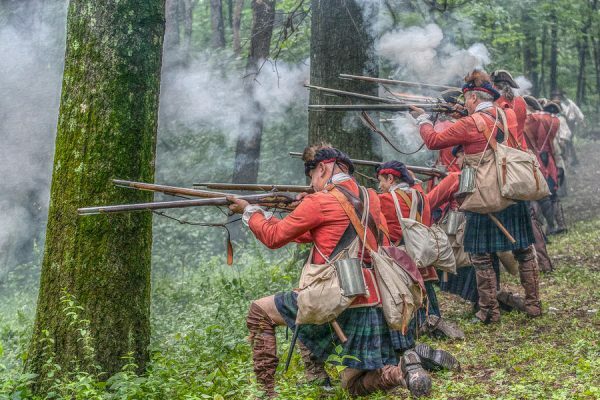 The Battle of Bushy Run Reenactment is the premiere event for the year, pitting the forces of his Royal Highness King George III against a confederation of Native Americans. See all the colors of war in the vibrant recreations of the two-day Battle of Bushy Run Reenactment that the various participants bring to life. Learn about how the battle progressed as well as how people lived in the mid-eighteenth century. Activities include two battles daily, sutlers, British and ranger encampments. Tour the Bushy Run Battlefield, Native American village and museum. Shop Sutler’s row; let your children enjoy special activities. Concessions are available. Also featured are eighteenth century military camps, a sutler trade area, period craftspeople and a children’s area. If you are visiting from out of the area, there are other sites relating to Bushy Run nearby. Overall, Bushy Run Battlefield is a hidden gem in Western Pennsylvania that is a must see site. Admission: Adults $8; Children 4-12, $5; Under age 3 – FREE! 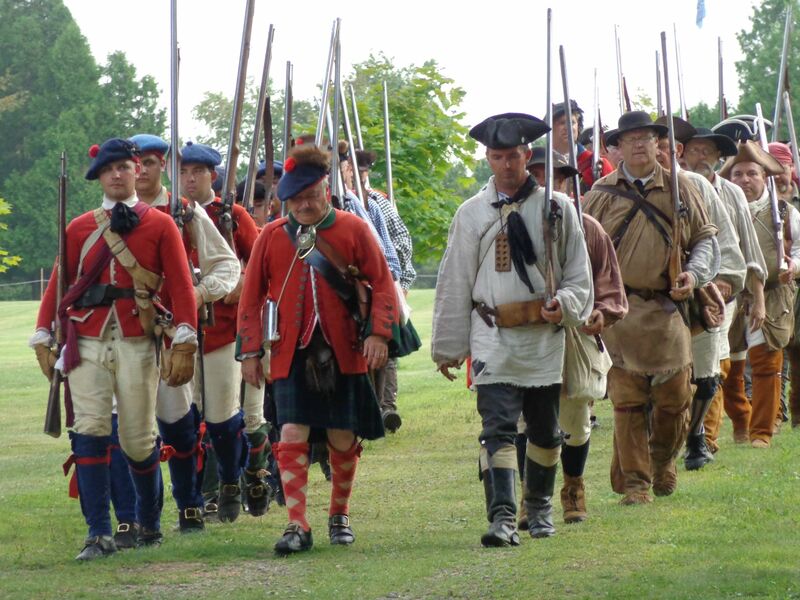 Hours: Saturday and Sunday, 10 a.m.- 4 p.m.
Reenactments: Two battle reenactments occur daily. The morning battle starts at 11 a.m. and portrays the events that occurred on August 5, while the afternoon engagement begins at 2 p.m. and shows the August 6 tactics that led to British victory. Email [email protected] for a registration form or more information. Note the deadline for registration submission is July 10. If you have any questions, you can also contact the Visitor Center by calling (724) 527-5584. Only Units or Sutlers invited by Bushy Run Battlefield Heritage Society (BRBHS) are permitted to participate. Please note: minimum age for participant is 17 years of age to carry and use a weapon (functional or otherwise) in demonstrations or opposing force reenactment. Check-in begins at 12:00 PM on August 4th, and Check-out is required by 4:00 PM on August 7. An Individual Registration Form is required for all participants over the age of 18 unless part of a unit. Unit Commanders may register their units, then an individual form is not required for each member. All British battle participants must be a part of a Unit. All reenactors must camp in their respective camp. No facial hair is allowed for Native reenactors. The dress and equipment of participants will be reviewed prior to each event day by a jury which will admit or deny participant to battle. All demonstrators must specify that they are demonstrating and what they are demonstrating on their registration form. All demonstrators who are under the age of 16 will be required to have proper release forms from Department of Labor in order to be paid.  Parents or guardians can include children under the age of 18 on their registration form.